OK, don’t faint…but I baked. This coffee cake was a result of a kitchen day planned for last Sunday with its prediction of an eight-inch Spring snow storm. As I type this, we recovered nicely, had beautiful Spring temperatures during the week and the prediction for today is a good old fashioned afternoon thunderstorm. Perhaps our snow days are behind us? Before we get to the recipe, I want to point out my cake dish. It was my mom’s and it lived on our kitchen counter while I was growing up on the farm. My mom baked daily. And she baked several things daily. She’d bake after breakfast and after my father had left to work in the field. This cake plate always displayed either a cake, a pie, coffee cake or cupcakes. And next to it was a tray of cookies, or a flat cake or another pie. Our house was a stopping point for farmers heading to and from the fields, or wives delivering lunches to them in the fields, and you could always count on Pastor Sam to stop by. No invitation was ever needed. Visitors who dropped in were greeted with a cup of coffee and a plate of the dessert of their choice and we’d sit at our long dining room table for a chat before everyone returned to their routines. That’s just one of the things I miss about Kansas farm life. 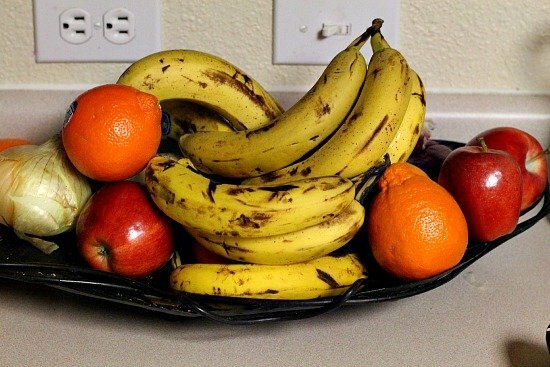 The mountain of fruit that had accumulated on the kitchen counter included three bunches of bananas that were nearing the point of no return. I had to either serve a complete dinner of bananas or bake them into something scrumptious. This cake recipe was to the rescue. 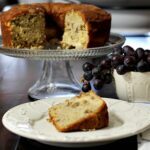 We had Tangerine Braised Chicken for dinner and this Creamy Banana Coffee Cake for dessert. It comes from one of our Junior League of Denver cookbooks, Creme de Colorado. The cake’s special because hiding in the middle is layer of cream cheese that’s been whipped into bliss with sugar, eggs and nutmeg. With chopped pecans and typical coffee cake flavors of cinnamon and nutmeg, this is a moist and delicious cake that will have your neighbors ringing that doorbell. Don’t forget to have that percolator plugged in. Combine cream cheese, 1/3 cup sugar, 1 tablespoon flour and 1/2 teaspoon nutmeat, beating until smooth. Add 1 egg and beat again. Set mixture aside. Cream 1/2 cup butter, gradually adding 1 1/2 cups sugar. Beat well. Add 2 eggs, one at a time, beating well after adding each. Combine soda and hot water and add to creamed mixture, stirring until well blended. In a separate mixing bowl, combine 3 cups flour, baking powder, salt, 1/2 teaspoon nutmeg and 1 teaspoon cinnamon. Add flour mixture to butter mixture alternately with orange juice. Stir in vanilla, bananas and pecans. Spoon 1 1/2 cups of the banana batter into lightly greased 10 inch tube pan. Spread cream cheese mixture evenly over batter. Spoon remaining banana batter over cream cheese. Bake at 350 degrees for 50 - 55 minutes or until a wooden pick inserted in center comes out clean. Cool 15 minutes before removing to a rack to finish cooling. Brush with melted butter and sprinkle with 1 tablespoon sugar combined with 1/4 teaspoon cinnamon. Garnish with whole pecans or walnuts to finish. Creamy Banana Coffee Cake…It’s what’s for Company. 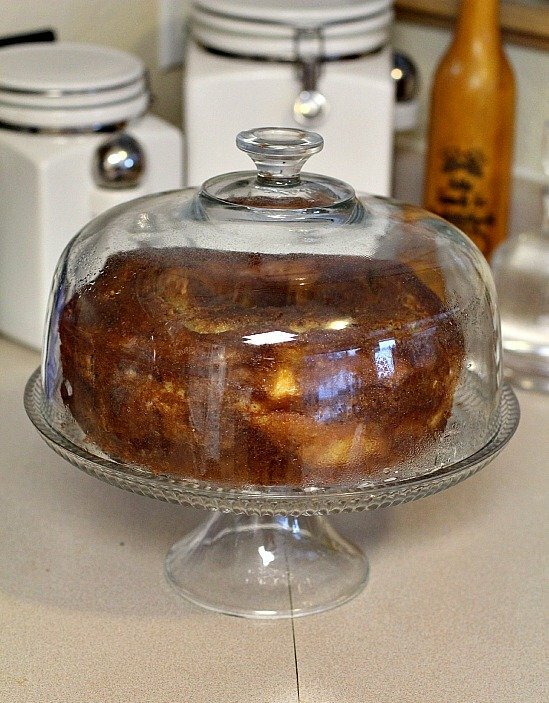 Wow…that would be one of my favorite coffee cakes. Thanks William, we sure liked it. That looks like one moist coffee cake Lea Ann. I just may make this for a crowd this summer. Glad you liked the aioli; anxious to see your post. Maybe for my next batch I’ll make the tater tots from scratch. Thanks Penny. 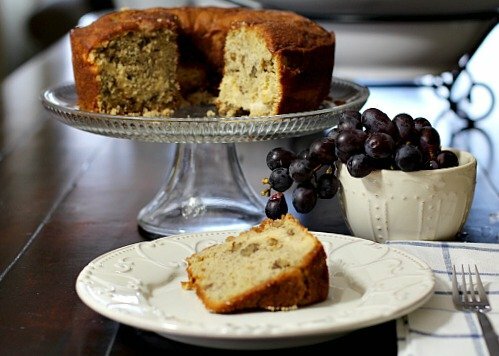 What a sweet story about your mom, she sounds wonderful, love your banana coffee cake it sounds delicious. The cream cheese is such a great addition. Ooohhhh, that is one pretty coffee cake and I love the idea of cream cheese hiding inside. You certainly ate well during that spring snow storm! I am going to try this recipe out and will have to look for that cookbook, it is one that I don’t have but know I’d enjoy. Thanks Holly and yes, that cookbook is a really good one. If you see it at a garage sale grab it. I think it’s out of print. We ate all week due to that darn snow storm. And there’s more to come. I love kitchen snow days, but really wish they’d keep to February. I love reading your growing up stories. And, with a gorgeous cake plate like that you need to bake more often! Thank you Vickie! I agree about using Mom’s dishes. There’s a memory with each and all. This cake sounds incredible!! Love the list of ingredients!! Dying to make this!! Thanks Deborah! And you know how I feel about that Bruschetta Alfredo – omg. It must have been a real treat to visit you mother and have a cup of coffee and a sample of her baked goods. My mother baked bread daily and always have rolls or cornbread for dinner, but unfortunately I didn’t inherit the baking gene. Your coffee cake looks lovely and beautifully presented too. Happy Easter to you and Bob. I love the story about your mum and baking. I grew up on a farm and my mum was very similar. We always had a choice of homemade pies and cakes on the go. Great Memories aren’t they Corina. You had me at the title. Then when I read that heartwarming story about growing up on the farm with all that food – every day. Wow, your mother was something special. I suspect the apple didn’t fall far from the tree. This cake will be on my cake dish soon. Just waiting for those bananas I bought yesterday to mature. Except for that apple isn’t a baker … what’s up with that? 🙂 Thanks Maureen. Espresso Banana Bread??? That sounds incredible. Good for those hens! Don’t Faint! 🙂 I heard about that oven. My sympathies. Mmmmmm. It looks and sounds incredible. Wish I had a slice to go with my coffee right now. I had to pull my copy of Creme de Colorado off the shelf just to see where it was and why I had missed it over all these years 🙂 It sounds really good! I loved reading about your cake stand, you mother and life on the farm in Kansas. Where was this farm? I always dreamed of being a farm girl because growing up we were surrounded by farms. I was never so lucky! I guess there is still time for a gentleman’s farm! And if I ever get one, I will bake this cake. But I might not wait that long! I think our snow days are behind us too. I think. Loads of thunderstorms in the future, though. Lovely cake, wonderful story about growing up. And how nice to have that cake dish — and to be part of its history. Excellent read — thanks. I have just the bananas for this at home. I smelled them while making Trevor’s breakfast this morning and literally thought to myself that I need to make banana bread or something tonight before they go all the way bad. I love the title ‘creamy’ grabbed my attention. The cream cheese in the recipe is always a plus. Unfamiliar with the hot water and soda deal too. Soooooo I tagged this recipe. As others have also noted, it looks delicious—make that double delicious. Naaaa—-triple delicious—-and that’s my last offer. That hot water and soda thing was new to me too. But then again, I’m not familiar with the chemistry involved in baking. I agree with that triple delicious. We enjoyed this recipe. That’s a beaut of a cake, Lea Ann. Aren’t Junior League cookbooks the best? Also fascinated by your ground turkey investigation. Good heavens, who would have thought? Thanks Kloe. I’m not a baker and I was able to make this beautiful coffee cake. Enjoy. And thanks for stopping in and the comment. This is amazing! I’m always looking for banana bread (muffins) recipes and am glad you shared your family recipe with us. It is a must try! I also love the savory and Mexican inspired recipes you have! Thanks Mira. And thanks for stopping in. Always love new visitors.